This is the witching time of year, the season of the Crone! In ancient times, the Goddess as Crone or ‘Queen of Witches’ ruled the autumn harvest festivals. Hekat in Egypt, Hecate in Greece, Latin Proserpina, Semitic Lilith with her sacred totem the owl, Celtic Cailleach, Welsh Cerridwen – these are just a few of the many manifestations of the Crone Goddess. It is interesting that many of the words we apply to Crones have been twisted from their original meanings to represent something vile, ugly or evil. Hag derives from the Greek ‘hagia’, meaning ‘holy one’. There is little agreement as to the derivation of witch, but suggestions include the ancient Indo-European word ‘weik’, which connects to religion and magic; the Anglo-Saxon witega, a prophet or seer; a relationship to wit, or wisdom; a root meaning ‘holy’ or ‘sacred’. Some people believe that the word Crone is rooted in the meaning ‘crowned one’, though standard etymology still has it as a Middle English term of abuse. Halloween has its roots in these ancient traditions, particularly Samhain (pronounced SOW-en) Samhain is the most important of the Celtic festivals, the end of one year and start of the next. It is a day on which to remember, to commune with and honour the dead. At the same time it was a celebration of the eternal cycle of rebirth. It is a time of endings, of coming to terms with the many small deaths, the losses that are part of every life. But it is also a time of beginning, of transition and change. It is a time to go within, a time to come to know yourself, to celebrate the growth you have realized over this last cycle and release all that was in preparation for what will be. Samhain night exists outside time and between worlds, deeply rooted in mystery and enchantment. As an archetype, the Crone assists us in transition from one life to the next, leaving one level of our existence and entering the next, hence her association with Samhain. I find this illuminating as to the nature of the Crone. For me it creates a sense of her as a midwife of the soul. She teaches us that sometimes we must let go if we are to move on. Looking back at the my visual exploration of the crone in 2010, I love the idea of the season of the Crone as a time to harvest experience and to become a way-shower. an older woman who has learned to walk in her own truth, in her own way, having gained her strength by acknowledging the power and wisdom of the totality of her experience. She is “a wise old woman’. A Crone is a woman burnished bright by an inner fire that sharpens both her wit and her intensity, her passion and her power. much like an inherent talent, that needs to be recognized and practiced in order to develop. This wise presence in your psyche will grow, once you trust that there is a crone within and begin to listen. Then in the quiet of your own mind, pay attention to her perceptions and intuitions and act upon them. Crone qualities are the distinguishing features by which a crone (as a woman or an archetype) can be known. savor the good in their lives, knowing how fortunate they are still to be alive. It takes a woman with an understanding of two of the most basic of human needs to evolve into a modern Crone. Those needs are connection and community.
. . . This is an amazing time to embrace your inner Crone. More than ever the world needs the comfort and certainty that wisdom and experience from a life well lived can give. The voice of expertise and mastery combined with the sageness of maturity and wisdom assures us that there is hope. We need these enlightened guides to bring us safely into the future. That is the role of the new modern Crone. Meditating today, I remembered the sense of metamorphosis as I emerged from the stage of maiden to mother. I had a vivid image of pouring all the learning, the experiences, the insights from my life into a great cauldron set amongst the flames and brewing an elixir of transfiguration. I was aware of the Crone as the most powerful embodiment of the feminine, freed from earlier responsibilities and constraints, connected to mystery and a kind of primal wildness. 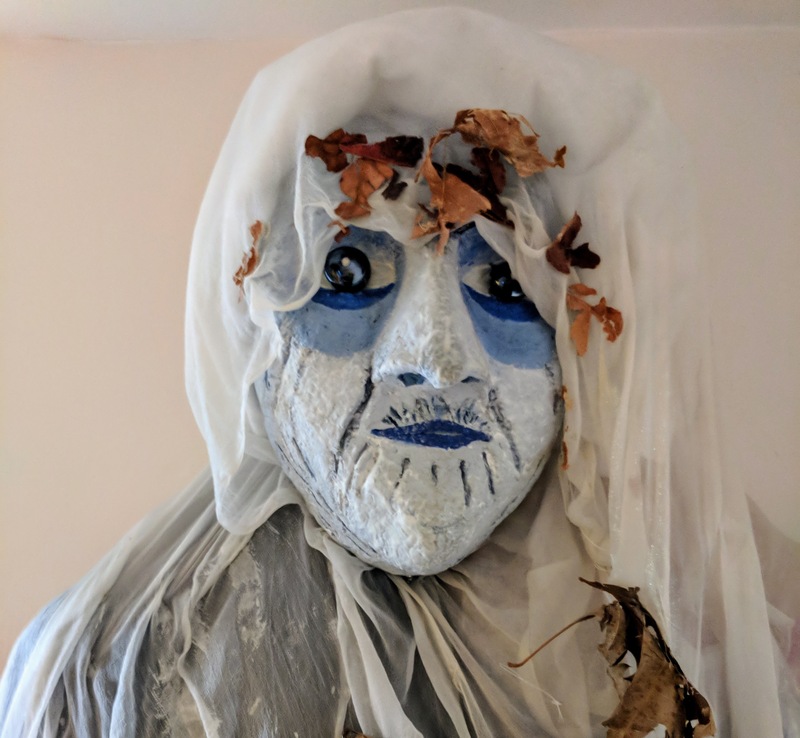 I am excited to embrace the season of the Crone, to discover in myself its potential and consciously to recognize and practice those ways of being that manifest it most fully. At 60, I definitely feel myself entering into the age of the Crone. Some definitions would say you begin to cross the threshold at 50. But it was at 44, writing a journalistic exercise about looking forward to a specific birthday, that I first welcomed the vision of this aspect of later life as a woman. I am looking forward to delving more into what this means to me over the coming months, but I thought I would start with that early vision. I’m looking forward to being 70. After that I will consider myself to be on extra time, with nothing owed and naught to loose. I will gleefully claim my freedom to ‘wear purple with a red hat that doesn’t suit me’. At a mere 44, the milestone of my allotted ‘three score years and ten’ lies well beyond the horizon. But already I feel the first intimations of the influence of the waning crescent moon, symbol of the Goddess in her final incarnation of ‘crone’. Perhaps bound up with our contemporary obsession with physical appearance, our pursuit of an illusion of eternal youth, the ‘crone’ has had some very bad press. The word invokes an image of an ugly, wizened, witch of an old woman, maybe embittered and very possibly evil. Is it any wonder that so many women run scared of the inexorable accumulation of birthdays? I am not soaked in the spell of paganism, claim no great knowledge of its lore. But I willingly embrace its vision of the crone as the ultimate, most powerful manifestation of womanhood. She personifies wisdom, compassion and completion. Her closer relationship to death is not one of fear but a potent awareness of renewal. So, when I reach 70, dressed in crone’s purple, I will cherish my wrinkles and wear them with pride and relief that youth’s vanity is done. I will breathe deep, walk slow and do nothing, joyously! I will undoubtedly ‘misbehave’ outrageously. I’m looking forward to being 70.